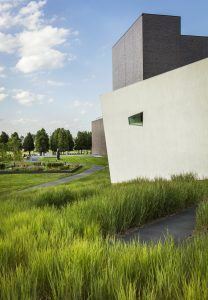 The Walker Art Center Wurtele Upper Garden received the Award of Excellence. HGA served as the executive landscape architect to the design firm, Inside|Outside. The Walker Art Center is one of the nation’s top contemporary art institutions. The new Wurtele Upper Garden is a part of a larger vision to re-orient the main entry of the museum, strengthen the relationship with the Minneapolis Sculpture Garden, and create a Walker Art Center campus. The vegetated volumes and the circuit path that connects them enhance the welcoming entry approach and provide dynamic experiences for engaging art. The re-imagined garden provides flexible, impromptu programming to accommodate large-scale public events. The garden reinforces the Walker Art Center’s status as an artistic and social hub. Comprehensive and elegant; good interpretation of the local landscape. Whitetail Woods Regional Park received a Merit Award in the General Design category. Whitetail Woods Regional Park is the first new park Dakota County has developed in over 20 years. A collaborative design team of landscape architects, civil engineers, and architects worked closely with the client team and stakeholder groups to vision, program, design, and implement a “21st Century Park”. Over 10 miles of trails, an event pavilion, nature play area, and camper cabins were creatively placed within a diverse 450 acre landscape. Landscape architects guided the design and development process to create a park with unique character, each move inspired by the site and the experiences it provided. Excellent in scope and detail; spoke to regional scale.